Location: Paris, France... Air France Lounge. Italy was jaw-dropping. I've never had so much fun being a tourist in a city and found the history that seeped from every pore of the place to be not only charming, but inspiring. As for Italian men, i may have found a new 'type.' lol. There were definitely some head-turners and as with most Europeans, all were well-dressed and in-shape. Asthetically very nice indeed. A very smallish B-lister celeb sighting in Venice: A visibly drunk Kathleen Turner asking for a pannini in St. Mark's square and letting the guy behind the counter know 'who she was.' Interesting. 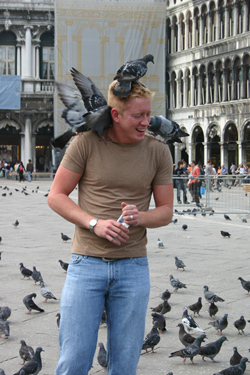 I found more entertainment value in feeding the pigeons, as pictured above ;) lol.